Park Lane Guest House in Austin, Texas is located right off South Congress, in a residential neighborhood. The eco oasis has everything from free range chickens, to organic mattresses & bedding, an outdoor pool, even a complimentary vegetarian or vegan breakfast. My time at this eco retreat was one filled with bliss, relaxation and detoxification. Park Lane Guest House was the first vegetarian bed and breakfast that I have ever stayed at. 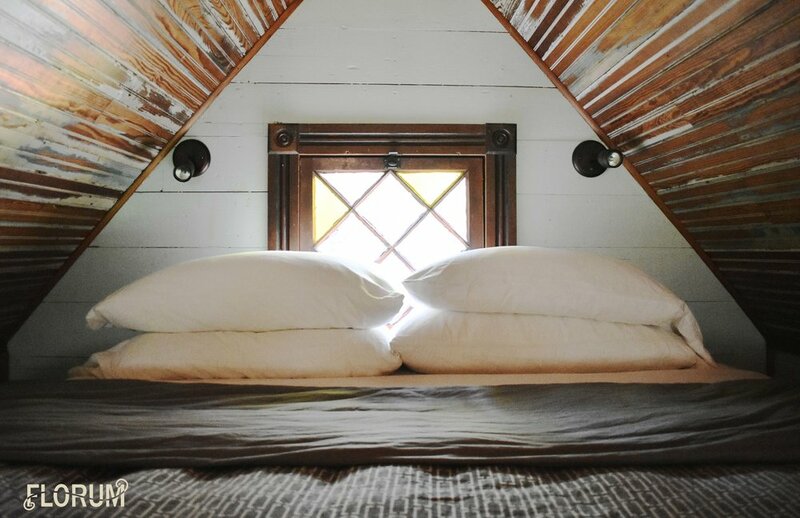 Every detail of this eco retreat in Austin, Texas down to the organic robes, was carefully thought out and non toxic. I was lucky enough to stay in the Vicky House, which is a private cottage that makes the most of its space. This tiny house was styled after a Victorian cottage and built entirely of reclaimed wood and materials (even down to the window pictured in the first photo). My stay is in this tiny custom sustainable house, really brought the term eco travel to a whole new meaning for me. Making the most of the space, the bed in the Vicky House is just a short climb (up a wooden ladder) to the king organic plush pillow top mattress. However if the thought of climbing up a ladder to your bed isn't appealing, don't worry as the Park Lane Guest House has 3 other rooms that are accessible wothout a climb. I absolutely loved the bathroom, while it was not the largest that I have found in a Bed and Breakfast, it included everything from a antique pedestal tub & shower to organic cotton robes. When staying at a Bed & Brekfast that calls itself 'eco,' I don't doubt that they will have clean skincare products. However there are a few products that I have not been able to travel without recently. The sisal dry brush from Merben International, an amazing a sea clay and activated charcoal 'Calm Facial Bar' from Ayr Skincare, and jasmine lavender organic bath salts from Pevonia. One product that I have not been able to travel without recently, has been a dry brush! The benefits of dry brushing are just so incredible, they include reduced cellulite, blood circulation, exfoliation, clears & cleans pores, and even lymphatic support. The dry brush that I have been traveling with (pictured above) is from Merben International, and can be bought online for only $34 HERE. The details in the Vicky House were seriously my favorite, even down to the shower and bath faucet handles. Just an added bonus to know that the entire cottage was sustainabily built and created from reclaimed materials. I love wine and was really impressed with the local Texas wine that is offered in the room for purchase by thePark Lane Guest House. Not only was I able to sip on a piece of Texas, however I was also introduced to a whole AVA in the USA (I had no idea wine was grown or produced in Texas). The vegan breakfast tacos in the morning were absolutely divine and some of the most delicious I have ever tasted. Not pictured (but included in my breakfast) was grapefruit that was grown on the property and orange juice. During my tour of the Park Lane Guest House, I saw this book 'Veggie Hotels' and was immediately drawn to it. Not only has Park Lane Guest House been featured in this book, but this little vegetarian bed and breakfast was one of the first in the United States to be featured on their website. One of my favorite things (not to mention surprise) was seeing the outdoor shower near the pool! Surrounded my bamboo this airy beautiful shower serioursly takes you on a trip to the tropics. Austin, Texas unfortunately has mosquitos, however I wasn't bit once, since this natural non toxic mosquito repellent was provided by the Park Lane Guest House and left by the pool for guests to use. I loved that the brand Bye You Bug is also Made in Texas, and smelled amazing. Knowing that the Park Lane Guest House had a pool (and how hot and humid Austin, Texas can get), I brought along one of my favorite natural sunscreens from Butter Babes. This certified organic coconut cocoa body butter works as a natural, non toxic sunscreen and leaves your skin both protected and hydrated. You can purchase this alternative natural sunscreen HERE for $48. The courtyard next to the pool was so whimsical and beautiful, one of my favorite aspects were the chandeliers hanging from trees and pace peace flags strung across the yard. I am such an animal lover and one of my favorite things about the Park Lane Guest House was the fact that they also have free roaming chickens (well technically they have the option to roam around the yard, if they choose to fly over the fence that protects them from predators at night). Freshly collected organic eggs from the Park Lane Guest House chicken flock. Luggage is something that everyone travels with. What you choose to buy and bring with you on a trip contributes to the carbon footprint you leave behind when traveling. Two pieces of 'green luggage" that I choose to bring with me, are Made in USA veteran owned Sword & Plough weekend duffle bag, as well as my hardcase Made in Italy Brics Milano carry on. Both these pieces are responsibly made and produced, not to mention, built to last. Please note that my stay at the Park Lane Guest House was complimentary, however all my thoughts about the Bed & Breakfast are my own. The standards of this B&B are both ethical and green, which fit into Florum Magazine's own ethical standards.